The old Jewish Cemetery in Prague is among the oldest surviving Jewish burial grounds in Europe. It sits in what is considered the best preserved complex of Jewish historical monuments in Europe, including the Jewish Town Hall and six synagogues. It is a monument to the Jewish Golden Age in Prague. It was established in about 1439, with the last burial in about 1787. Unique among cemeteries, the tombstones are so tightly packed that many literally rest one on top of another. 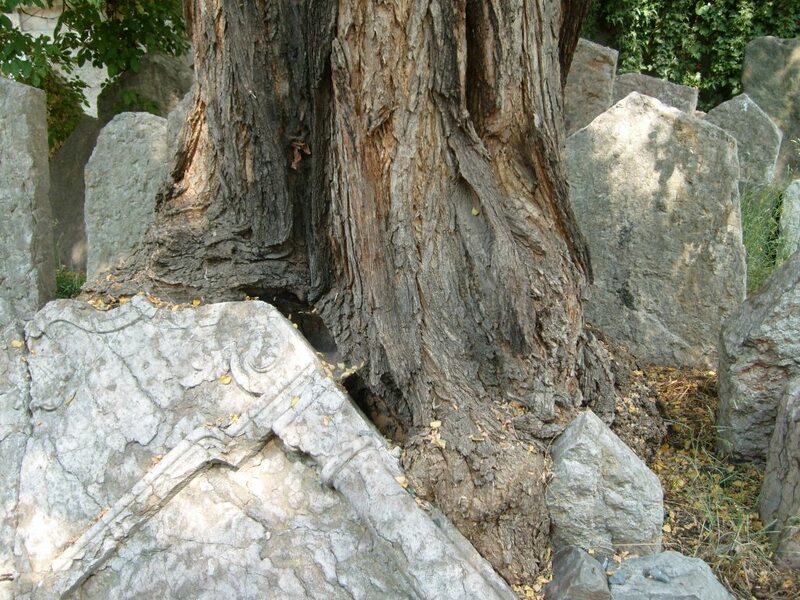 The ancient trees wrap themselves around the tombstones as though born from the stone. For 350 years the Jews of Prague were buried here. It is the resting place of Jews who made Prague their home when Prague was the cultural center of Jewish Europe. Especially during the 16th century, Jewish intellectuals throughout Europe gathered in Jewish Town. Many of these greats rest here, in the same cemetery that served the community in times of repression. The cemetery is surrounded by a massive stone wall, as though the wall alone is sufficient to protect the remnants of this rich culture that extends nearly 650 years into the past. Madeleine Albright visited this ancient cemetery on a visit to Prague in 1997. This was not just any trip, but a pilgrimage of sorts. Within the year, she had learned of her Jewish heritage, a heritage hidden from her family who fled Czechoslovakia in fear of the Nazis and again, years later, the communists. When she explored the cemetery, she must have learned of the leaders buried here, who, like herself, exercised great power and influence in their times. Secretary Albright will have been told of the first burial about April 25, 1439, of Avigdor Karo, the “chief rabbi” of Prague, a poet and a scholar of the Kabbalah. Rabbi Karo lived through the destruction of Prague’s Jewish community in the 1389 Easter massacre in which over 3000 Jews died. She will have been told of Mordecai Marcus Meisel, (died 1601), a Philanthropist and leader in Prague, who lived through the persecutions of Jews in the mid-1500’s, financed the construction of Meisel synagogue in 1590-92. Meisel built a hospital, expanded the cemetery and paved the Jewish ghetto. She will have heard the stories of Rabbi Loew Ben Bezalel, Chief Rabbi of Prague, a significant Talmudic scholar and philosopher, buried there in 1609. Perhaps she will have been told of Rabbi David Ben Abraham Oppenheim, Chief Rabbi of Prague prior to his death in Sept. 12, 1736. Rabbi Oppenheim, a highly successful business man, a prolific author and a student of the cabal is said to have had a library of more than 7,000 books. Many of these books are now housed in Oxford’s library. These are only a few of the 100,00 people buried in these walls. As powerful as these images must be, with the cemetery symbolizing both life and death, there was more for her to experience. The Pinkas Synagogue sits in the same complex. Now serving as a museum, the synagogue’s walls identify over 77,000 Czech and Slav holocaust victims. Among those names are Secretary Albright’s paternal grandparents. Her grandfather Arnost Korbel, died at Theresienstadt in 1942. Her grandmother, Olga Korbel, died in Auschwitz in 1944. My husband I visited the Cemetery and Pinkus Synagogue in 2007. The list of the dead is a visual testament to those killed in the holocaust. I cannot imagine the profound sense of loss that Secretary Albright must have felt, on seeing her Korbel names on those walls. But I wonder, what might happen if I awoke on some future day to learn, as she did, that my heritage was not what I had been raised to believe. What if I learned I was Chinese, or African, or Persian, or Jewish. Would I develop a better understanding of the struggles, hopes and challenges of people of other races and other religions? Can I do that anyway? This entry was posted in Community, Travel & Adventure and tagged Ancient cemetery, Czechoslavakia, Jewish Cemetery, Jewish history, Jewish Renaissance, Josefov, Madeleine Albright, Prague, Rabbi Kara. Bookmark the permalink. The Old Cemetery in Prague is not the oldest surviving Jewish burial ground in Europe. 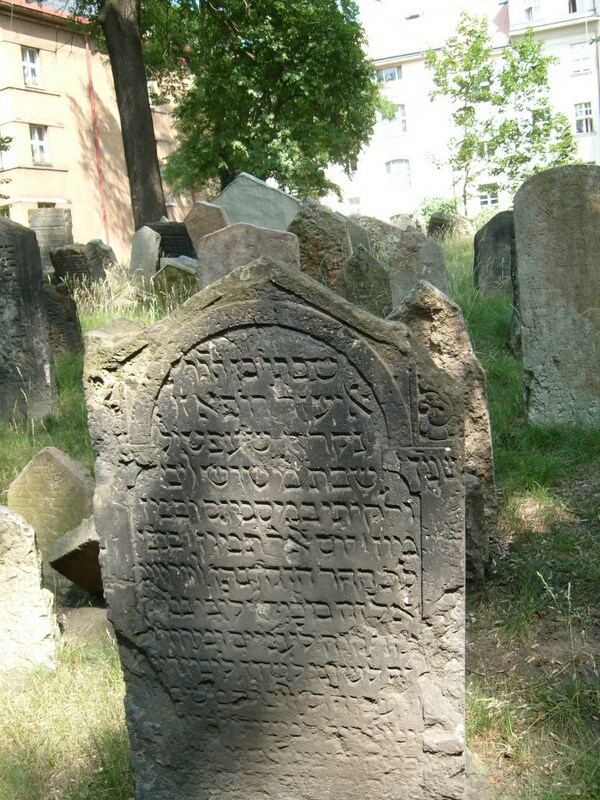 The Jewish cemetery in Worms, Germany, dates back to the 11th century (there is a stone from 1076). Where did you see the figure of 100,000 people buried there? There are about 12,000 preserved gravestones, and the number of people interred in clearly much greater, but I don’t think I have seen the 100,000 figure….. The most important general complex of Jewish built heritage in Europe is probably Krakow’s Kazimierz district (or maybe the ghetto in Venice) — because in Krakow and Venice, homes, streets, squares and other buildings, not just the synagogues and cemeteries, were preserved. Prague is among this top three, but in Prague, synagogues and the Old Cemetery are there, but the historic ghetto was razed about a century or so ago and replaced by the wide streets and more modern buildings that we see today. Thank you. I will amend my post today to reflect you comment.i read sceral articles that identified it as Prague. But I am always appreciative of more and Better information. I would love to know where you are from. Annandmeg, I’m interested in the name Meisel, which is how so many pronounce our name, Mesle. Hmmm. What a wonderful post. It’s now on my must-experience list. Thank you. I have not thought of that possibility. Because there is a long history of Mesles in France and near the German border, I have assumed all Mesles were either Protestant or Catholic as are those in France. The only records of our family that I can identify in Germany spell the name Messle, but since the German alphabet has a squiggly “double s”, I can’t really tell what that means. On the other hand, the Mesles in St. Louis are from an area of Germany very close to our own family’s German roots. I don’t know. In genealogy as in life, there is always more to study. In the direct maternal line, my great-great-great grandmother’s name was Messle, as spelled in her son’s wedding in St. Louis, MO. She was married to a J. Dietrich (Theodore) Kohlhoester. They were both from the Kingdom of Hannover. The family was Catholic, but from family lore, and proven through genetics, that line does have Jewish ancestry. So although there may be Catholic Messle families, they may also have Jewish ancestry. Fascinating. There are also Mesles with a single s in St. Louis. I have researched that family. Now I will see what I can find about yours. Thanks of sharing.